The traditional way of making a Rumtopf started with the first ripe fruit available and ended in autumn (November) with last fresh fruit (often pears). The general rule for making is: for 2 parts fruit you need 1 part sugar and approximately 3 cups Rum. Be sure that your Rumtopf pot is clean and thoroughly dry. Wash and clean fruit (remove stems, seeds, and pits), pat dry and cut into bite sized pieces, if necessary. Measure them. Add sugar, mix and let stand for about 1 hour. 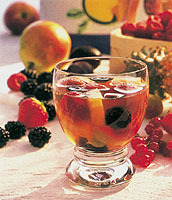 Place the sugared fruit into your Rumtopf and fill with rum to completely cover fruit. Place a piece of plastic wrap tightly over the pot top, then set the lid on top. Set aside in a cool place, away from sunlight. If desired, you could even refrigerate the pot. Repeat these steps with other fruit once a month until your Rumtopf is completely filled or fresh fruit season is over. Take care of your Rumtopf. Fill up with Rum if necessary. It is important that the fruits are always completely covered. After you have added the last layer of fruit, sugar and rum, let stand for about 6 weeks. Enjoy. Serve the Rumtopf fruits with its syrup (hot or cold) over ice-cream, cake, flan, puddings, or cheese cake. Serve topped with whipped cream or crème frâiche. Serve as a side dish with any game meat. Serve the strained liquid as an after-dinner cordial. Add two tablespoons of the strained liquid to Champagne. Lay some of the warmed fruit onto a crepe and roll up. Add whipped cream or ice cream, if desired. 1 The traditional way of making a Rumtopf started with the first ripe fruit available and ended in autumn (November) with last fresh fruit (often pears). The general rule for making is: for 2 parts fruit you need 1 part sugar and approximately 3 cups Rum. 2 Wash fruit, pat dry and cut into bite sized pieces, if necessary. Measure them. 3 Add half of weight sugar, mix and let stand for about 1 hour. Fill fruit into your Rumtopf and add as much Rum, so that fruit are completely (fingerbreadth) covered. 4 Close Rumtopf and set aside in a cool place. 5 Repeat these steps with other fruit “until” your Rumtopf is completely filled or fresh fruit season is over. 6 Take care of your Rumtopf. Fill up with Rum if necessary. It is important that fruit are always completely covered. 7 After you have added the last “layer” fruit, sugar and Rum let stand for about 6 weeks. Enjoy. 8 NOTE: 1-step preparation. Use any kind of fruit you like. Use a good mixture of different fresh and ripe fruits. Prepare them as describe above. After you have put them into the Rumtopf cover them with Rum. The Rumtopf should be completely filled. Let stand for 6 weeks. Enjoy. 9 NOTE: let stand at least for 6 weeks or even more. And keep the Rumtopf always in a cool place. 10 NOTE on fruit: you can use almost any fruit, but use a mixture of different ones like stone fruit (plums, peaches, nectarines, cherries), berries (strawberries, gooseberries, cranberries, grape wine, and others), you can use figs, apples, pears. Just keep in mind that the fruit will be in the Rum for a long time, so the fruit should be firm enough. 11 Number of servings can not be given. Time to make includes time until first use.